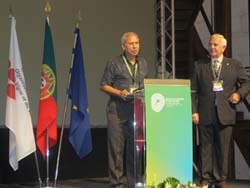 July 06: Subhash Arora, Editor of delWine and President of Indian Wine Academy was presented “Mérite de l’OIV” - Medal of Merit, by the Paris-based International Organization of Vine and Wine, at its 34th World Conference on Vine and Wine held in Porto as recognition for his outstanding service within the international vine and wine sector, according to a report by IANS, Lisbon. He is the only Indian to be given such recognition by the Paris-based OIV which has its roots going back to 1924 and has 44 member states, including practically all wine producing nations such France, Italy, Spain, Germany, Austria, Australia, New Zealand, South Africa, Chile and Argentina. The award was presented during the 9th General Assembly of the OIV that ran concurrently with the World Conference that was attended by 800 participants from June 20-24, says the report carried by several online media including Economic Times. 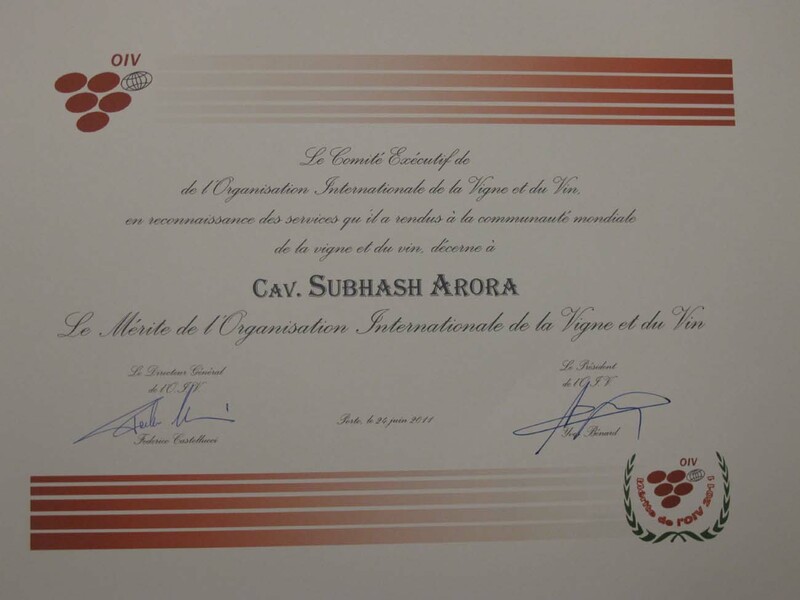 The award was presented during the 9th General Assembly of the OIV held after the conclusion of the World Conference attended by 800 participants. President Yves Benard congratulated the recipients of the award that included Marie-Christine Tarby-Maire (France), H.E. František Lipka (Slovakia), M. Fernando Bianchi de Aguiar (Portugal) and Tony Spawton (Australia) who could not attend as he had a heart attack a few days earlier. Every year 4-5 wine experts are given this prestigious Award globally. After going through all the details and the basic procedure, India applied for membership on January 12 this year. According to the rules, a majority of the member states must agree to accept the potential member nation. Any member may object within 6 months of application. Federico Castellucci, Director General of OIV said that he expected no opposition to India being welcome as a full member unanimously. In his informal acceptance speech, Arora said he was honoured by the recognition which was truly for India and that he was just doing his job as a wine journalist. India would benefit a lot from the membership and he hoped the acceptance would be unanimous. He also added in zest that though an infant in the world of wine, India would be a force to reckon with in twenty years when an Indian might even stake claim to be the Director General, a 5-year mandate through vote by the membership, which Castellucci holds for the second term through 2013. Earlier, while releasing the annual statistics on the state of vine and wine industry from 2002-10 at the inauguration of the Conference on June 20, Castellucci observed that India was the ninth biggest producer of grapes including the edible varieties. This is a key sector in which India is also expected to benefit significantly from the scientific information available. 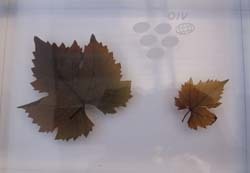 OIV is globally recognized for its competence for work concerning vines, wine, wine-based beverages, table grapes and raisins. The scientific and technical information in these areas is freely shared with all the members. India, with no wine laws in place will be able to leapfrog and have access to a lot of relevant information and the experience of member nations. Arora was knighted by the Italian Government in 2009 for his meritorious work in promoting wine culture in India, especially with respect to Italy and awarded the title of ‘Cavaliere’. He has been nominated twice for the ‘Best International Wine Journalist Award’ by Comitato Grandi Cru d’Italia, an association of quality Italian wine producers. Although he did not win the Award, www.indianwineacademy.com was voted the Best Website by the members of the Association in March this year during Vinitaly.